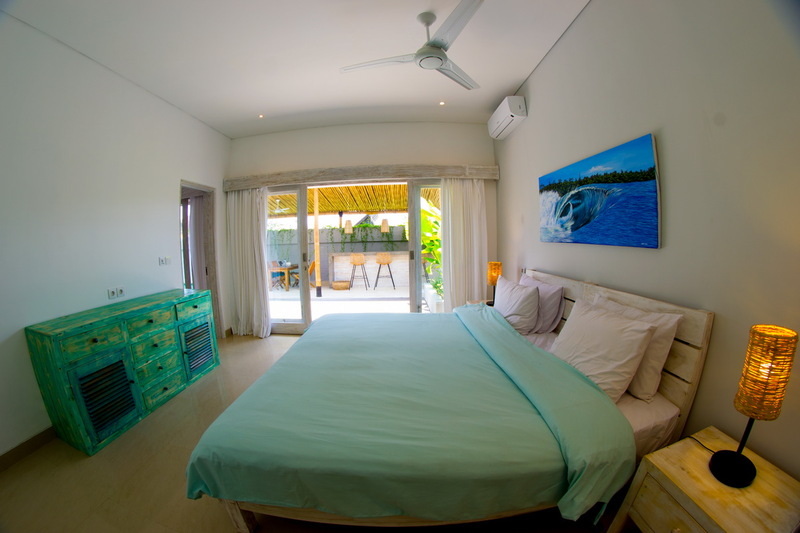 From $ 557 $ 395AUD per night We have direct contracts with most villa owners. We don't add any booking fees. We are 100% transparent with no nasty surprises. 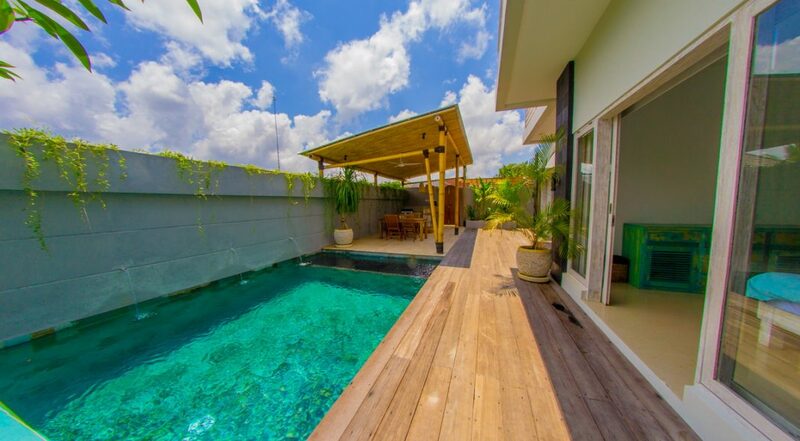 Only 50m to beach in Bingin - rent this now! 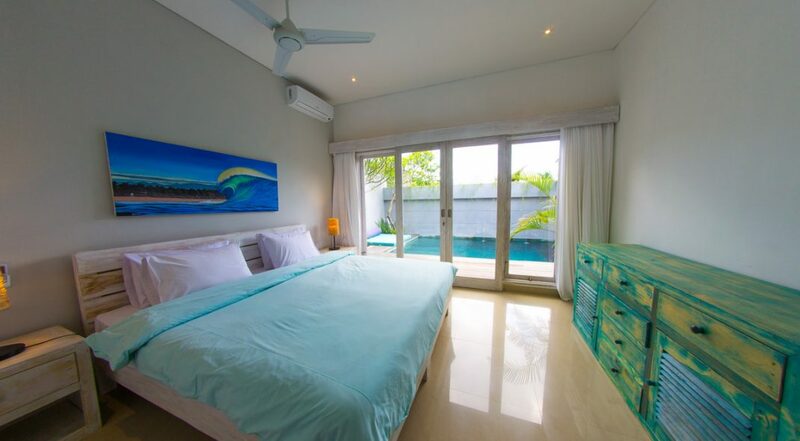 Villa Mahi Mahi is a brand new beach side 4 bedroom Bingin holiday villa to rent, set atop the cliffs of the beautiful Bingin Beach on the Bukit Peninsula. 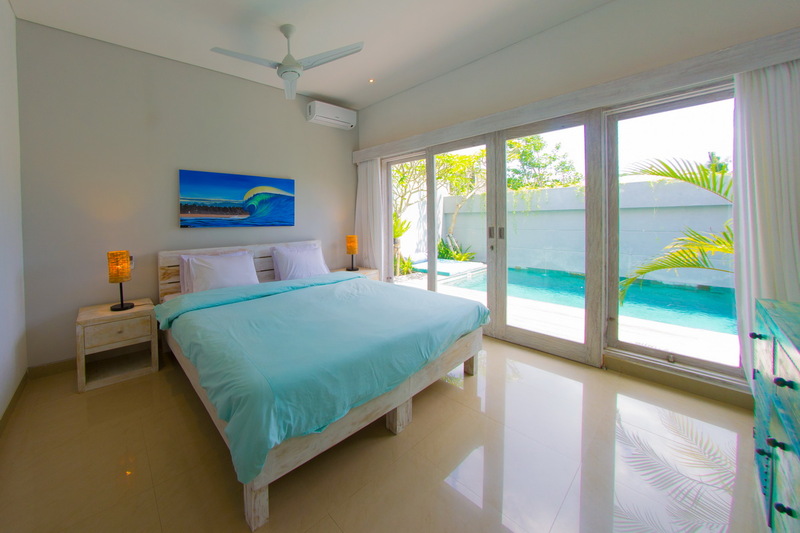 The villa is built over 2 storeys and features a great outdoor area with your own private pool, it offers all the modern amenities for a very comfortable stay with an authentic beach holiday house vibe. 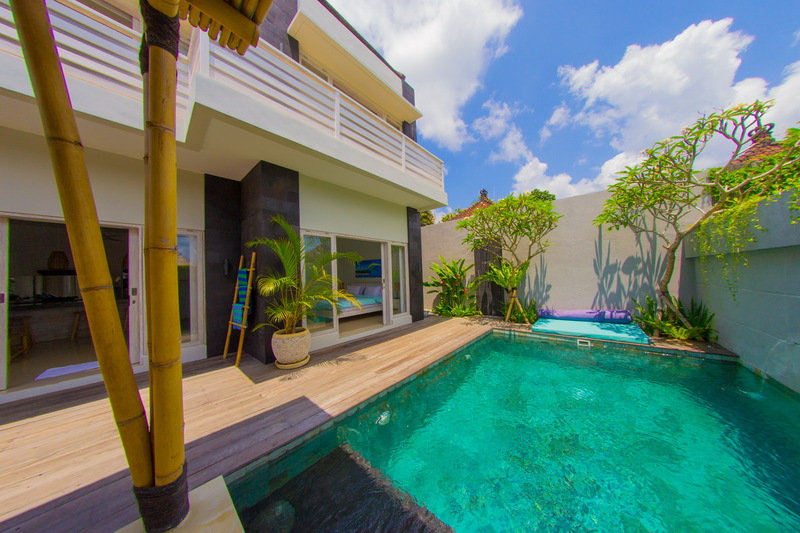 Situated just 50 meters from the beach its perfect a family or group of friends wanting to enjoy an amazing holiday, filled with sun, surf, and plenty of fun! 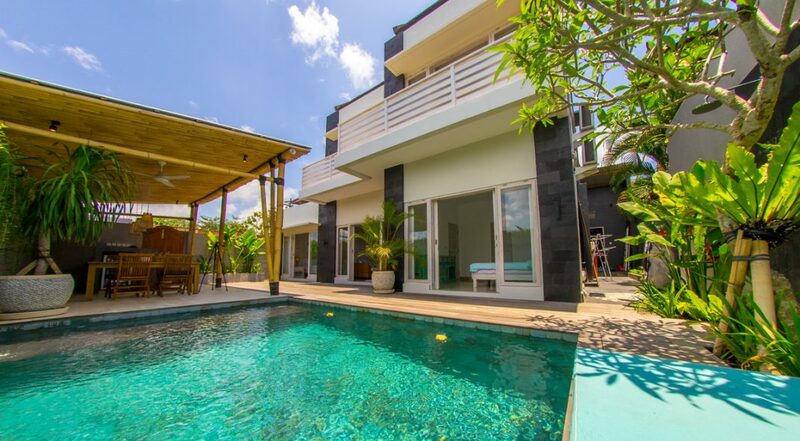 The villa is modern with contemporary design elements, the two storey building overlooks the stunning outdoor pool. A high wall provides guests with complete privacy, a spacious timber pool deck borders the pool, at one end you can stretch out on the daybeds comfy pastel cushions under the shade of some gorgeous frangipani trees, how ideal after a strenuous early morning surf session and rinsing the salt water off in the crystal clear pool. 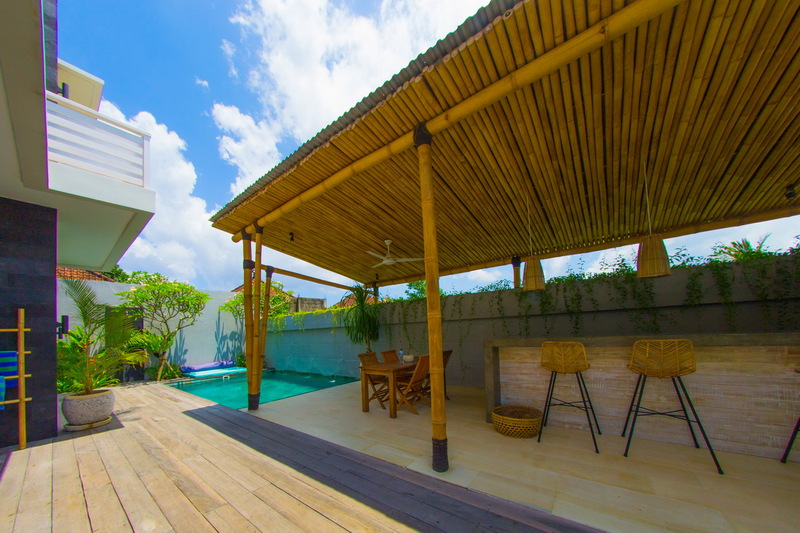 There’s a fantastic gazebo by the pool crafted from bamboo, enjoy breakfast or lunch here under cooling ceiling fans and chic bar stools are ready for you to enjoy some refreshing ice cold beverages together after a day’s surfing or swimming in the gorgeous blue waters at Bingin Beach just 50 m away. 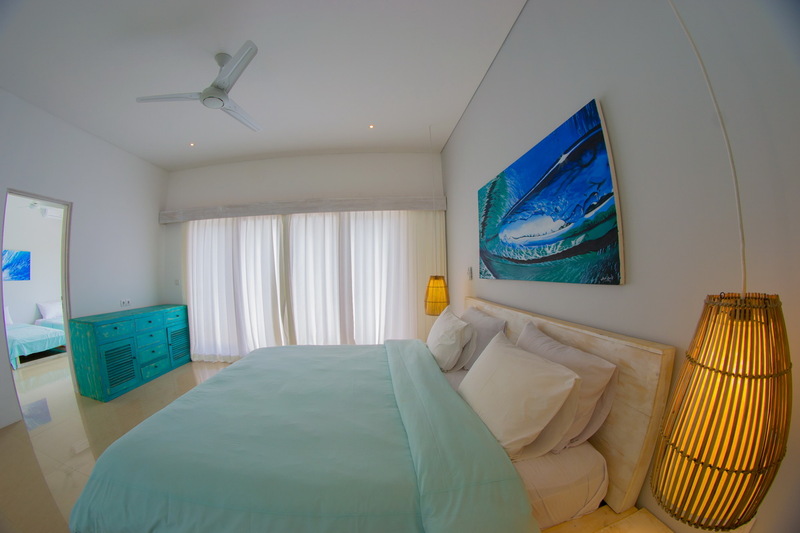 Villa Mahi Mahi is simply furnished giving it an uncluttered and elegant feel to its living and lounge areas. 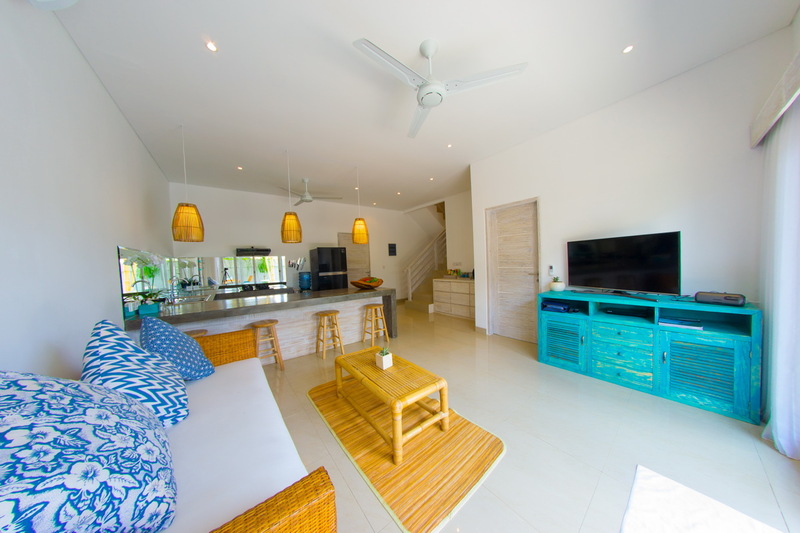 The downstairs living room is open-plan to incorporate the TV and entertainment area along with its stylish kitchen it, opens up to the pool deck and outdoor alfresco dining facility, guests can enjoy meals at the breakfast counter or dine in the poolside gazebo. 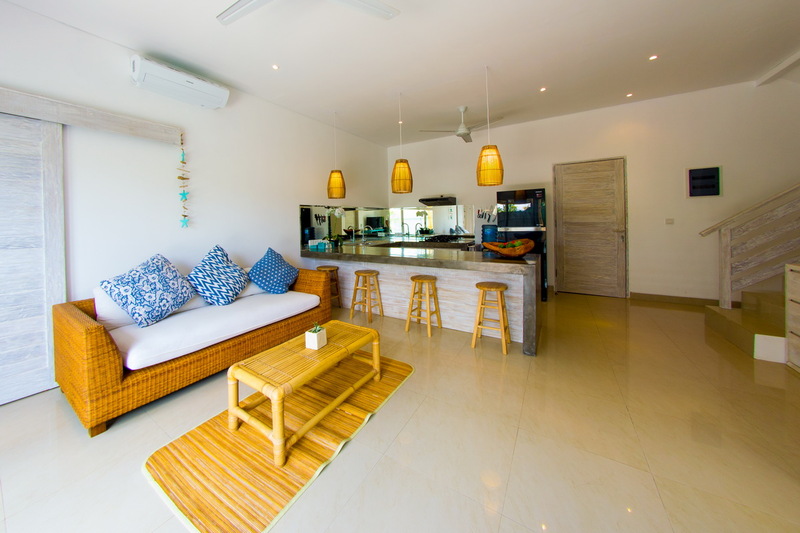 The large LCD TV has international cable channels and a trendy rattan sofa with large soft cushions in sky blue hues add to that beach house vibe. 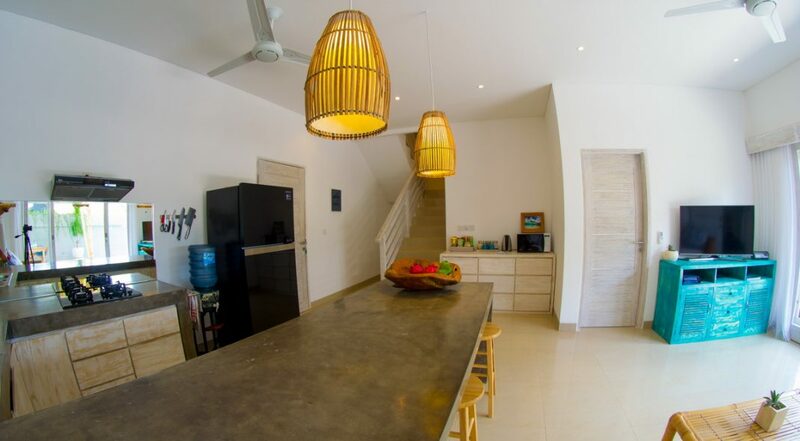 The stylish kitchen with lovely polished cement counter tops, bar stools, a hob cook top and large fridge to fit plenty of groceries and cold drinks. 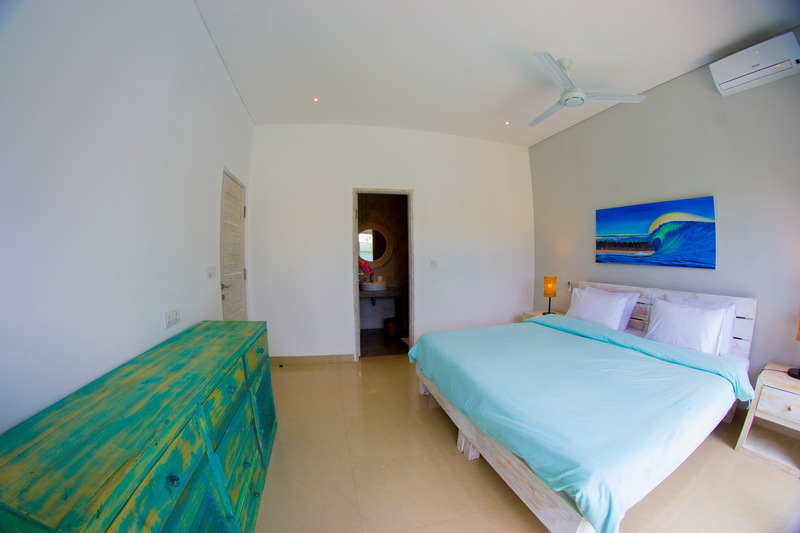 The villa features four wonderfully bright and fresh en-suited bedrooms providing guests with spacious and comfortable accommodation. 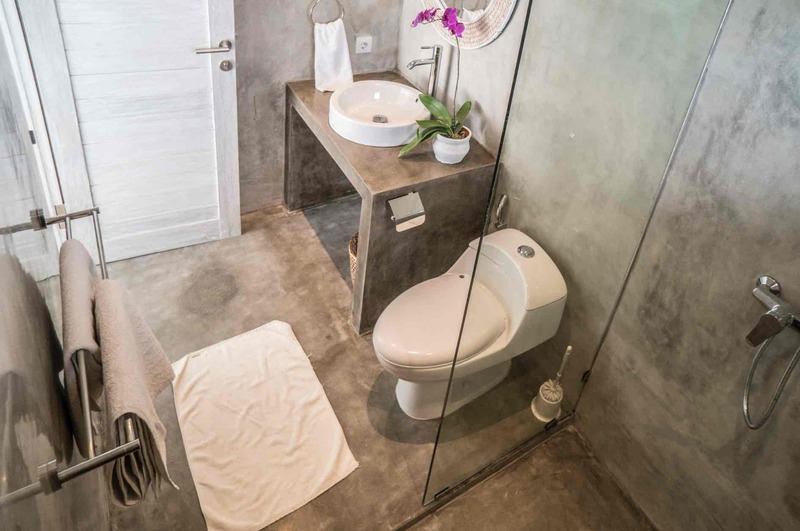 On the ground floor are two bedrooms which share an adjoining bathroom while the bedrooms upstairs are ensuite and have a connecting door between them, making it perfect for parents traveling with young children. 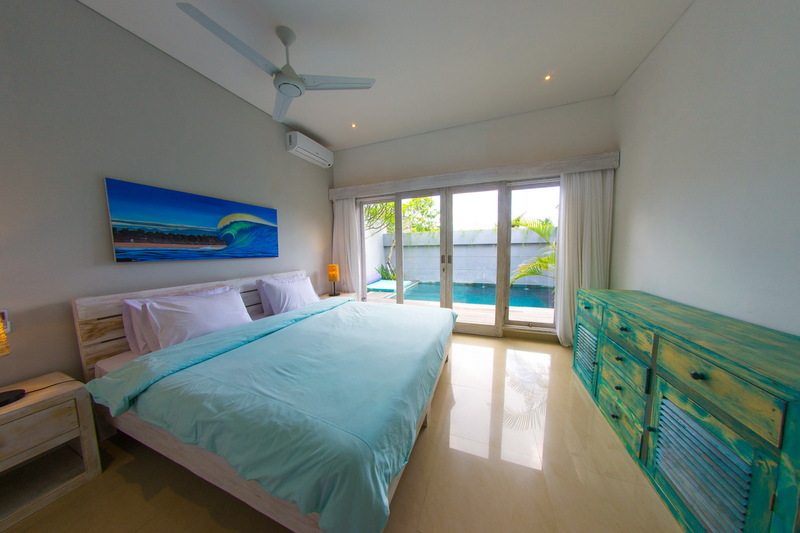 Two bedrooms feature huge king size beds and the other two rooms have convertible large sized twin beds. 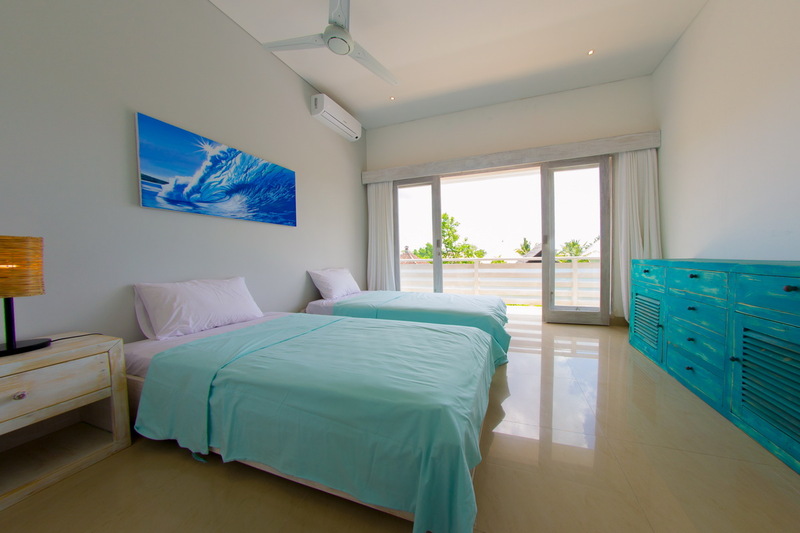 Pastel bed throws, vibrant seascape wall art, stark white walls and ceilings, recycled boat wood timber furnishings and large doors opening to the pool and balconies make the rooms very fresh, bright and inviting. 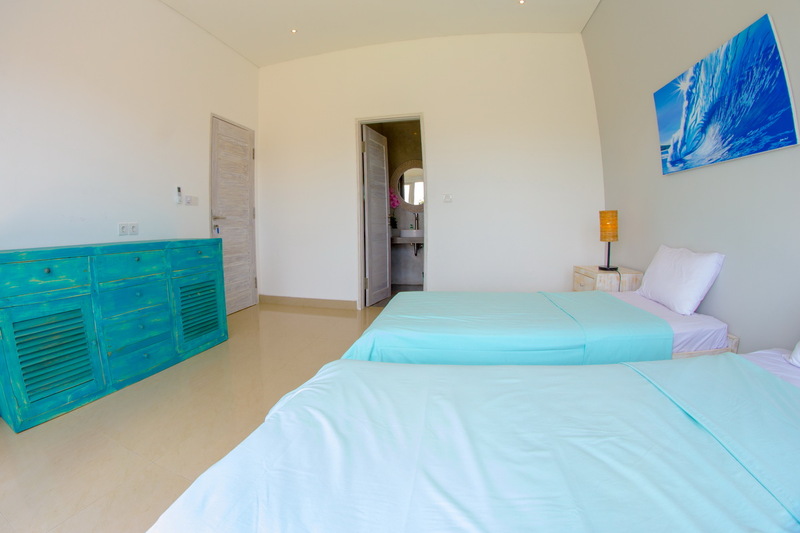 The villa has a full time villa manager, supervisor, nanny service and offers laundry service as well. 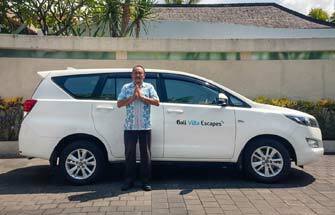 Throughout your stay, the staff will ensure that you are comfortable and well taken care of, they can assist with advice on where to go and what to see around the locale and book transportation for you. 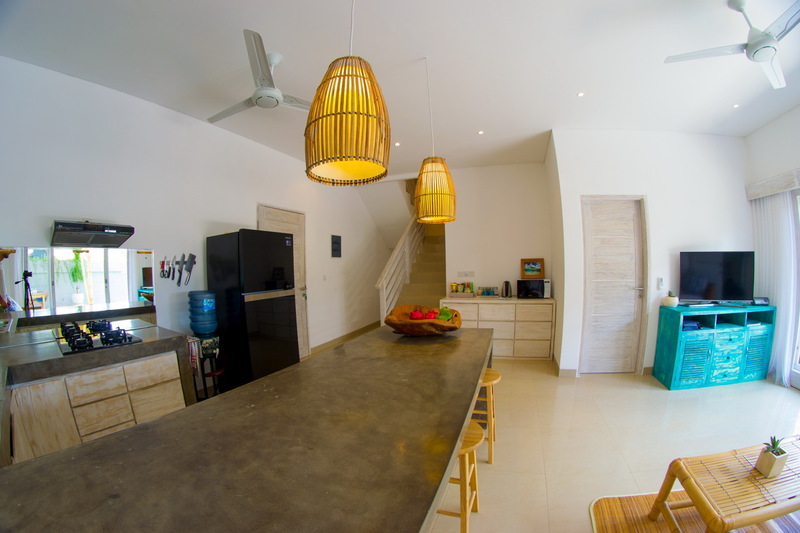 The staff will clean the villa daily. 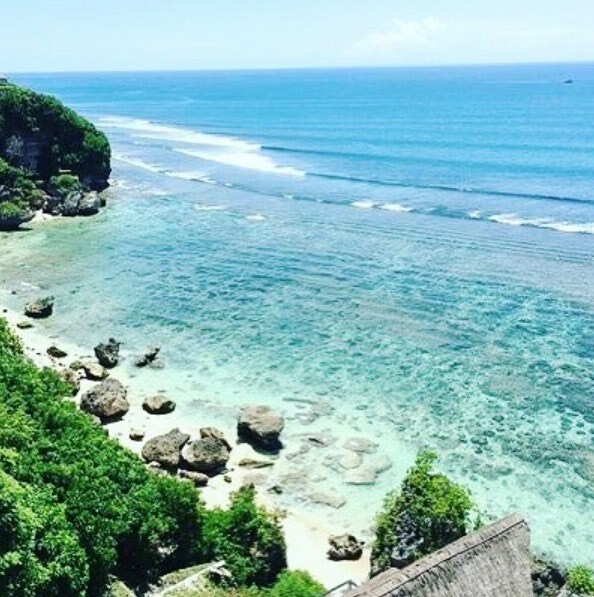 Surrounding the villa are the best surf spots in Bali, ranging from Impossibles, to Bingin, Uluwatu, Dreamland, Balangan, Greenbowl – what more could you ask for? This is a surfers paradise, on top of that there are plenty of casual cafes and eateries very close by such as the very popular Cashew Tree. Some modern eating options include The Bukit Cafe, La Passion Cafe and Grocer & Grind. The newly built Drifter Surf Shop & cafe is also close by. For a slightly fancier dining experience check out Balique, El Kabron, Sundara and Kats Kitchen for some great Thai food. 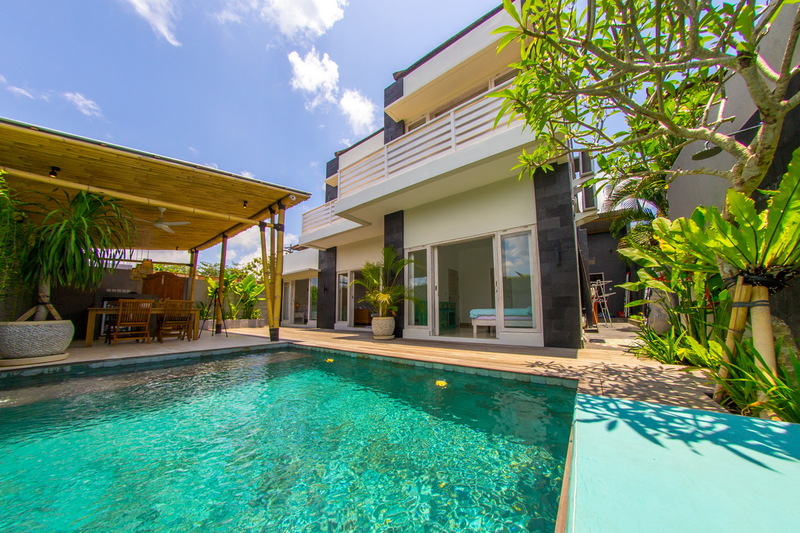 For a range of other Bingin Villas or 4 bedroom Bali Villas in the tranquil and beach lifestyle Bukit area, please browse this website for great deals. Book your Bali holiday at Villa Mahi Mahi well in advance as this is a really popular villa, especially if your planning a trip to Bali during the Australian school or public holidays. 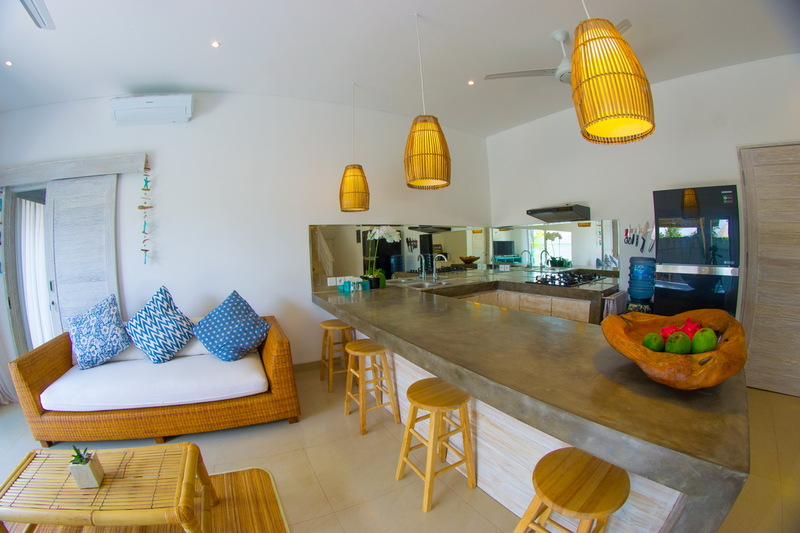 We spent a week here with our family and loved Villa Mahi Mahi from the moment we arrived. Our days were either spent by the pool relaxing or heading down to Bingin Beach for a surf, swim or just hanging out at the cafes by the water. 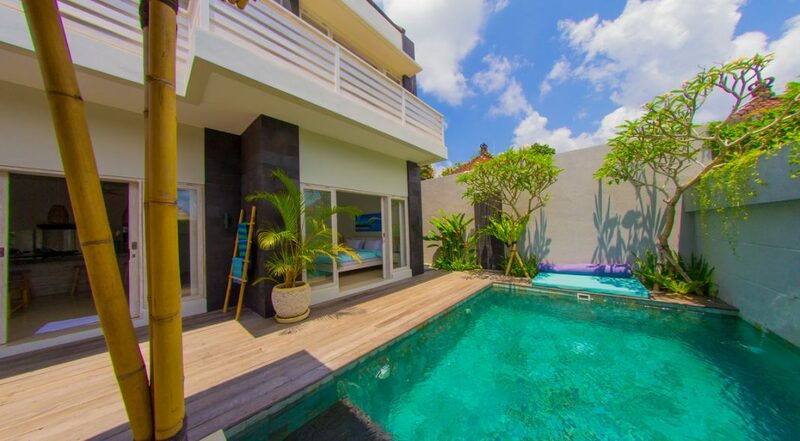 Everything about this villa is perfect. 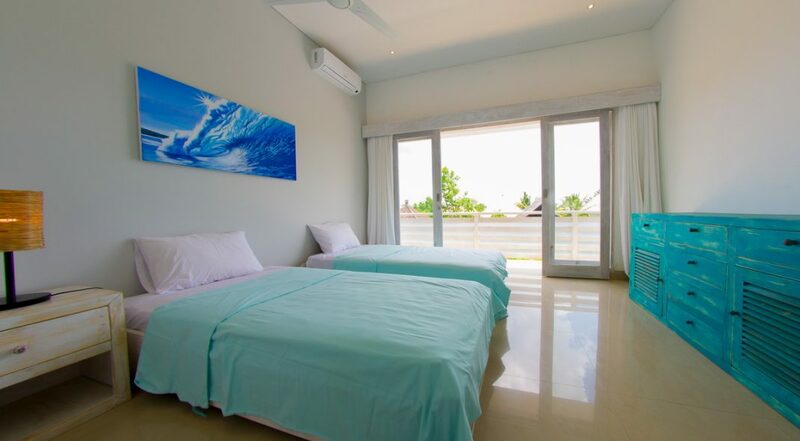 The price, the absolutely amazing location, the design, amenities as well as the clean modern rooms easily make this place a holiday to remember. The kids were blown away by how easy it was to get to Bingin Beach and were there most of the time. As far as restaurants and eating out at night, there were lots of local cafes and western style restaurants close by once you get to the main road. Other than that we were more than happy to chill out and eat in the villa most nights. The staff cooked the most incredible Indonesian meals for us! 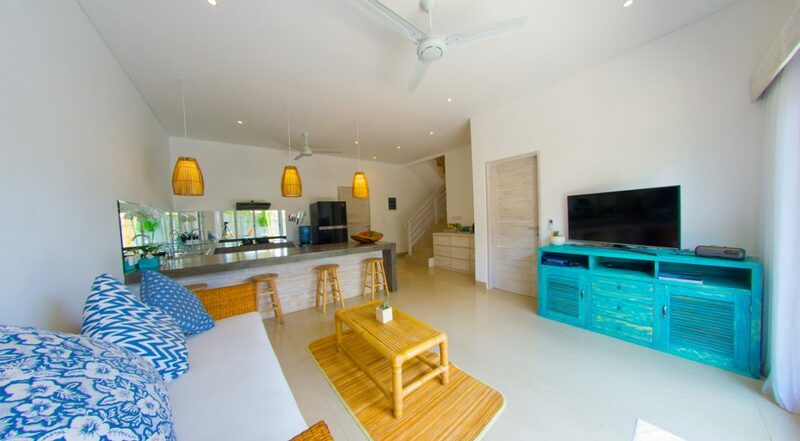 Without a doubt, Villa Mahi Mahi is a 10 out of 10 for us and we cannot wait to come back here again with the kids for another fabulous week. 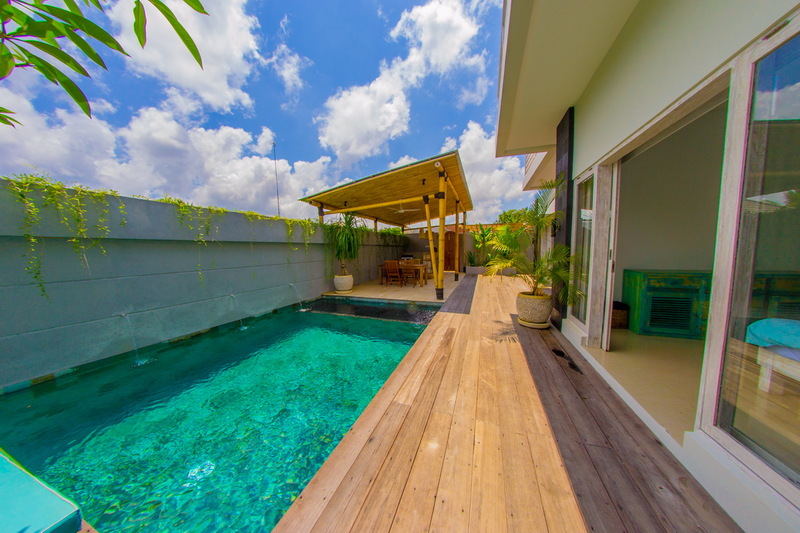 What else can we say about this villa other than WOW!! 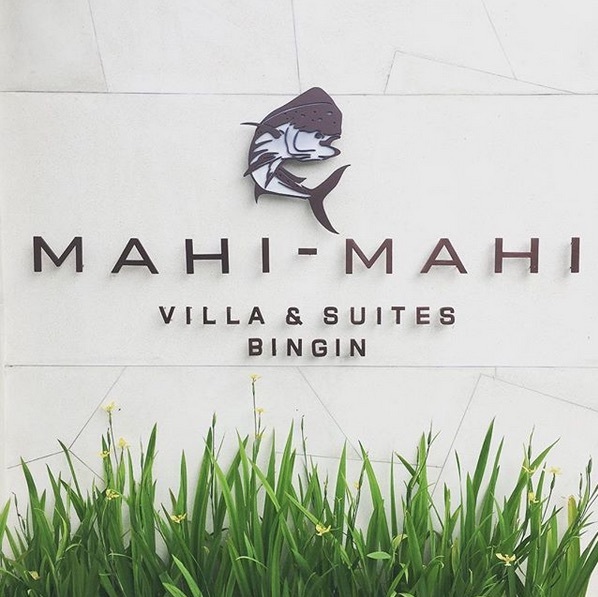 You really have to stay here for a couple of days to appreciate how fabulous the place is and experience what it's like to be so close to the really hip and happening Bingin Beach - villa mahi mahi rocks and we are already thinking about our next trip. Coming from Singapore is really easy to we will be back here soon! 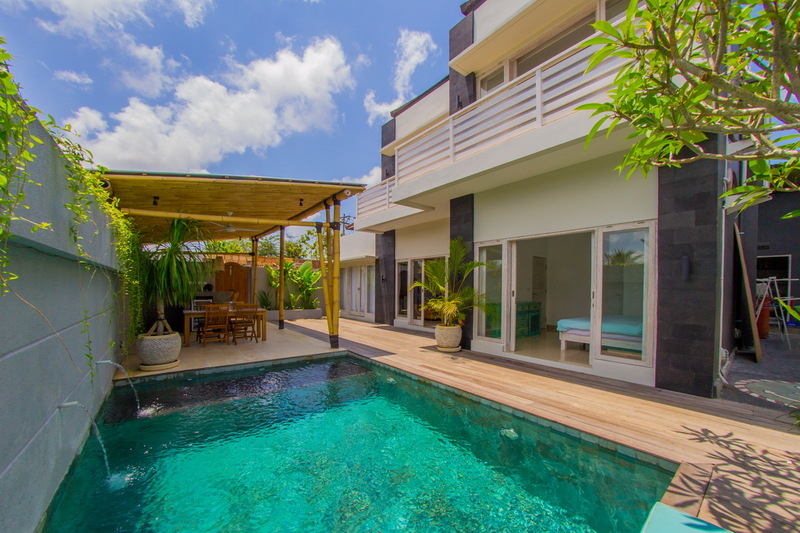 If your into surfing some great waves, being close to really great cafes and want to relax in a really chilled out area of Bali where you are well away from the crowds then definitely stay at Mahi Mahi. What an amazing Bingin location - such a friendly neighbourly vibe. 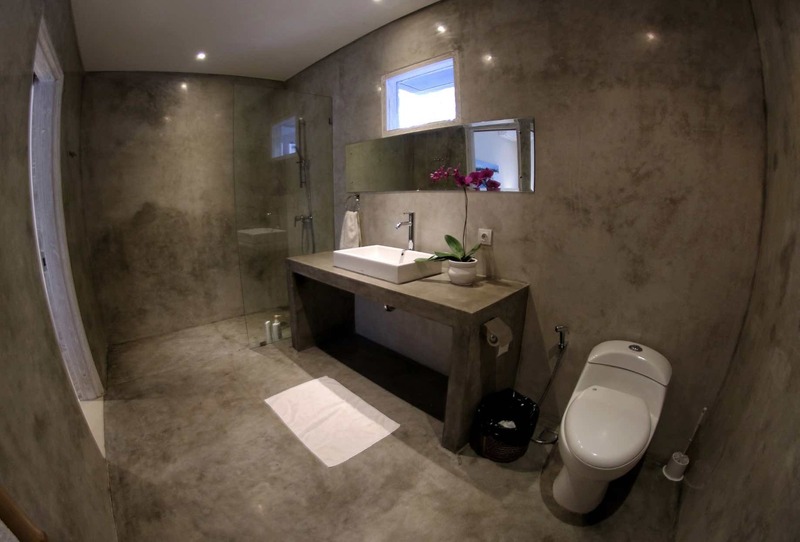 Clean and modern villa with the advantage of being near the beach. This is a fabulous villa!